DALLAS – FOX Sports Southwest will continue its coverage of the Dallas Stars through the first round of the 2019 Stanley Cup Playoffs. 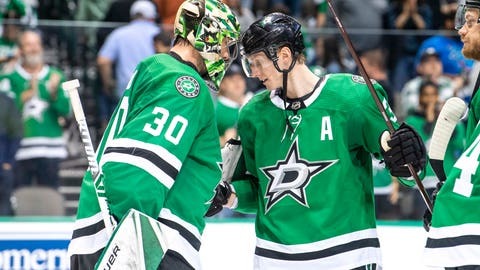 The Stars, winners of a Western Conference Wild Card spot, will open on the road against Central Division champion Nashville Predators on Wednesday, April 10, at 8:30 p.m. CT on FOX Sports Southwest. Coverage will begin with Stars LIVE! at 7:30 p.m. CT. FOX Sports Southwest’s complete playoff schedule is below. Play-by-play announcer Josh Bogorad and analyst Daryl Reaugh will call the action for every game on FOX Sports Southwest. Stars LIVE!will deliver the latest team news before and after every Stars game telecast on the network throughout the seven-game series. Brien Rea and analyst Brent Severyn will anchor FOX Sports Southwest’s pre- and postgame coverage. FOX Sports Southwest will televise expanded one-hour Stars LIVE! pregame shows and expanded Stars Live! postgame shows throughout the first round of the playoffs. For all home games, the shows will be broadcast live from Victory Plaza at the American Airlines Center. 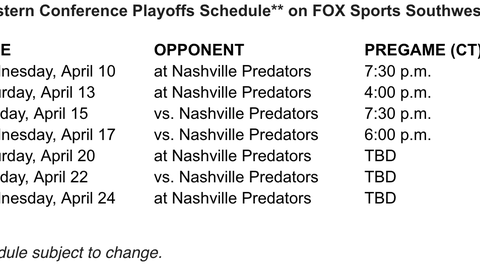 Stanley Cup Playoff games televised on FOX Sports Southwest will stream on the FOX Sports digital platforms. Available to iOS and Android devices, the platforms provide live streaming video of FOX Sports content along with highlights and instant alerts for scores and key plays. Fans can download the mobile app for free from the Apple App Store and Google Play. Streaming on the FOX Sports digital platforms is also available on connected devices, including AppleTV, Android TV, FireTV, Roku and Xbox One. Additional highlights and analysis will also be available on FOX Sports Southwest’s social media channels, including Facebook, Twitter, Instagram and YouTube. FOX Sports Southwest, the exclusive regional broadcast partner of the Dallas Stars, televised 80 regular season games in the 2018-19 season.